Part of what’s beautiful in inner city Dublin, particularly in Dublin 2, are the Georgian townhouses (with brightly and solidly coloured doors) which surround a Georgian square. There are three Georgian squares in the southside of the city – St Stephen’s Green, Merrion Square and Fitzwilliam Square. There are two other Georgian squares in the northside in Dublin 1 – Parnell Square and Mountjoy Square. Back in the days, if you were some wealthy Lord or Lady, you’d live in these townhouses that face the greeneries of the square. If you were less affluent, then you’d be relegated to townhouses that flanked the roads nearby. One such example is Baggot Street where this photo was taken. However, not all properties along the thoroughfare remain in the same style. Some have been replaced by buildings with hallmarks of modern architecture. 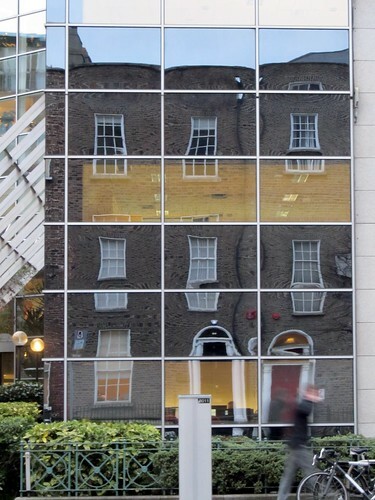 Not many of the new buildings are as pleasing aesthetically, but the distorted reflection certainly makes things a tad more interesting to anyone passing by. I’ll try to photograph some fancy Georgian doors tomorrow and share them here. in general, i usually am fascinated by distorted reflections. thanks!